We're not quite sure when – or if – there will come an anniversary at Bridge Road Brewers upon which it becomes impossible to up the ante for what's been its birthday beer for the past seven years. 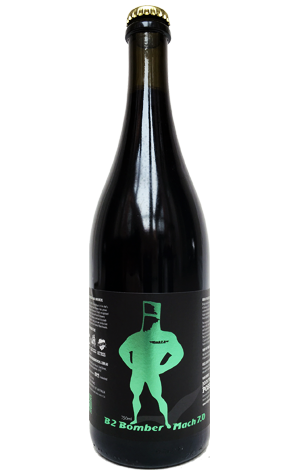 But, clearly, this year isn't that year as the B2 Bomber returns, shiny and green, with the brewery claiming they've increased the levels of malt and hops once more in what is probably best described as an imperial Belgian black IPA. The gelatinous beast clocks in at a round 10 percent ABV and is best approached like a big red: give it a little time to open up before piling in if you want to get the most from it. If you do, it allows the citrusy, herbal hops to break through, joining the sweetness provided by the booze and dark chocolate fudge like malts. Full bodied, somewhat sticky and not for the fainthearted, it becomes increasingly rich and dessert like as it warms (it is a birthday beer, after all) and the Belgian yeast's fruity nature attempts to make space at the table.